Raising trout to restore native populations and increase fishing opportunities in Southeast Minnesota, Lake Superior and many other areas of the state. Originally a farm, Crystal Springs was purchased in 1932 for $ 15,000 by the Division of Fish & Wildlife. It was the first tract of land purchased of the 27,000 acre Whitewater Wildlife Management Area. The Izaak Walton League played a key role in providing local support for the effort to protect the Whitewater Valley. The fish rearing raceways were built from hand carved limestone rock by the Civilian Conservation Corps. It took seven years to complete. Trout production started in 1941. The raceways were covered in the 1950's to keep out sunlight, debris and predatory birds. By 1980 the original limestone raceways had badly deteriorated. The Fisheries Construction Crew then renovated the raceways, ponds and dikes. Additional improvements were made in the 1990's that included a new hatchery and expanded rearing space for juvenile trout. Local Sentence to Serve crews were instrumental in repairing the last of the original limestone raceways (Raceway #12) which now holds brook trout and is open for public viewing. Artesian springs deliver water to the fish hatchery and are also the lifeblood of trout streams in this area. So where does the spring water come from? The glaciers that covered and flattened most of Minnesota 10,000 years ago didn't reach this part of the state. However, the melt waters from the glaciers did. The melt water scoured 300' deep valleys that exposed bedrock. Cracks in this bedrock began to release water that was stored in the ground in what we call aquifers. Resulting from this incredible geologic event, were artesian springs and trout streams. Here at the Crystal Springs Fish Hatchery there are two such springs that provide constant 48 degree water. They deliver about 2,000 gallons of water per minute. This water is also critical to the self-sustaining brown trout population in the South Branch of the Whitewater River. 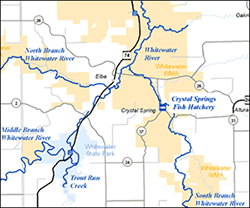 From the 1940's through the 1960's, Crystal Springs raised catchable size Brown and Rainbow Trout for "put and take" stocking in the Whitewater area streams. The end of the 1960's saw water quality and trout habitat improvements, along with natural reproduction of Brown Trout in many of the local streams. These improvements were due mainly to the application of Best soil Management Practices (BMP's) by farmers in the Whitewater Watershed. So, the role of the Crystal Springs Hatchery needed to change. Currently Crystal Springs raises brook trout, rainbow trout, lake trout and splake totaling approximately 45,000 pounds of fish stocked annually. The brook trout are stocked all throughout MN. The splake are transported to lakes in the Arrowhead region of MN. The Rainbow trout are stocked in high use areas where they are readily available to anglers. And the Lake trout are stocked into Lake Superior. Fish stocking is just one of the tools available to Minnesota's Fisheries Managers to use in managing the fish populations in lakes and streams. Stocking tends to be the first management technique employed when a fishery is depleted. It can provide some instant, but temporary relief to a collapsed fishery. However, Stocking does not solve problems such as poor habitat and degraded water quality. In fact, no state or federal agency can fix these things. It will take the cooperative effort of all residents in the state of Minnesota. It means that we all have to become more aware of our effect on the landscape. With advanced scheduling, we give tours to schools, scouts, clubs etc. This allows us to reach a large number of visitors with our limited staff. Our tours are educational and informational in nature and may be customized for the group. Tours are given Monday - Friday between 7:00 a.m. and 3:30 p.m. Phone: 507-796-8001. We are generally unable to give tours to drop-in visitors, but we will accommodate as time permits. The visitor center is our means of providing an educational experience for everyone. We continue to make additions and improvements to the displays.